Regardless of the country, street markets offer some serious shopping to travelers all over the globe! 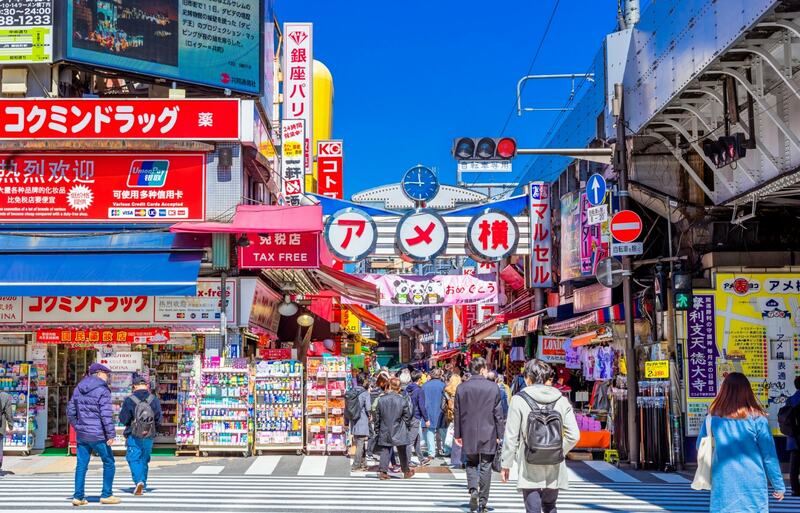 While Tokyo has some of our favorite places to shop, like Ginza for brand goods or Akihabara for electronics, neither place quite captures the exciting atmosphere of the Ameyokocho street market in Ueno. Keep an eye out for bargains galore! Take a little piece of Japan home with you with these stylish and versatile bomber jackets. In your average shopping center in a station, these can cost from ¥20,000 to ¥30,000 (about US$177 to $266) depending on the shop carrying it. 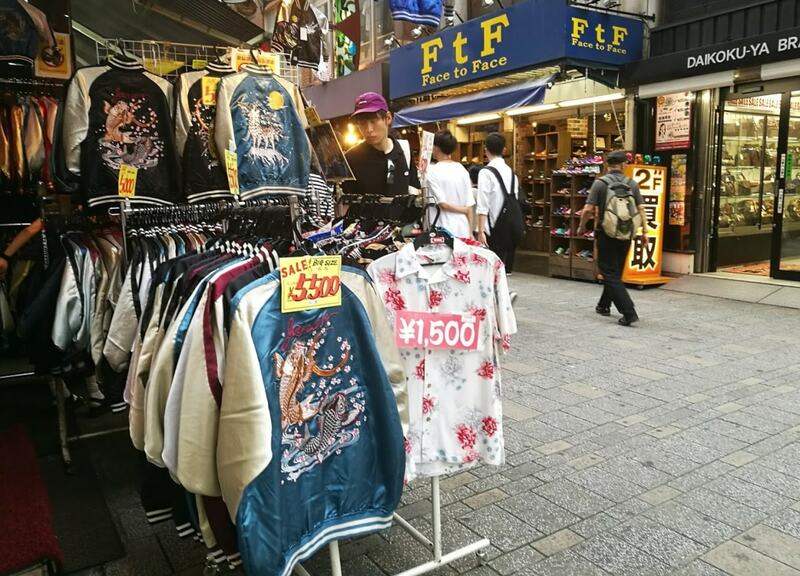 But as you scour the streets of Ameyokocho, there's no way to miss the rows of colorful racks of bomber jackets selling for under ¥10,000! There are interesting designs to choose from like geisha, flowers, collages of Japanese culture (sushi, ramen, sumo etc. ), and even maps of specific destinations like Tokyo and Kyoto. You'll definitely stand out sporting one back in your home country! You don't need to dig for deals when you come across the shops with heaps of athletic shorts with brand names like Asics selling from ¥80 to ¥100. If you're backpacking and you didn't bring enough stuff to wear at night, or you need something to wear on warmer days as you tour around (or heck, even if you just want to take advantage of these outrageously low prices), this is the best place to get comfortable shorts. The secret to their cheap price? They're factory overruns—but still, can't beat popular sportswear brands for that price! If you're looking for some cute clothes to bring home to a niece or nephew, Ameyokocho is one of the best places to do it! Between the character shirts, adorable dresses, tiny yukata and kimono it's almost too much to handle—especially with the deals you can find throughout. Just prepare yourself for the cuteness overload! If you're in the market for something kitschy or weird, there are toy shops aplenty throughout Ameyoko. Get masks, trains, dolls, figures, character goods and all sorts of collectibles! Plus some decidedly strange items you might not have bargained for. Fair warning though, there's a chance you'll spend more time here than expected! While sweets like Tokyo Banana or uniquely flavored Kit Kats are great souvenirs, why not consider an interesting non-edible option? Ameyoko has interesting, customized license plates from Japan, and an assortment of unique button and badges representing various aspects of Japanese culture. These cheap, lightweight and cool-looking souvenirs will last a little longer than any sweet treat you might bring back! If you love comfy, fashion-forward sneakers, then Japan's famous Onitsuka is the brand for you! In Ameyokocho packs a lot of styles and colors from past seasons, and offers them at a pretty significant discount. Like any expansive market, there are the occasional stores that will try to sell knock offs, so be sure to keep your eye out! If you're like me, when you hear the word "boots," the first brand that comes to mind is Dr. Martens (though perhaps they're just a part of my upbringing, like Trapper Keepers, jelly-colored mobile pagers and Backstreet Boys). But if you're of a like mind, you can get the classic lace-up black boots from this outlet shop in Ameyokocho! Even if your love for Doc Martens isn't nostalgia-fueled like mine, they have tons of stylish and sturdy options from which to choose. For eye-catching souvenirs that won't take up much of your precious luggage space, don't miss the super cute totes printed with cartoon versions of iconic aspects of life in Japan. Not only do they look great, but they're eco-friendly and can even make your return trip less of a hassle! Don't forget to check out character goods like the caps of the beloved Super Mario Bros. If it's rainy or overly sunny in Tokyo and you need an umbrella, don't deal with the high priced offerings from department stores or the plain (but functional) clear plastic umbrellas of convenience stores. If you want something that's useful but also pretty enough to bring home, get your sun shields from Ameyokocho. Be on the lookout for those that change colors once they get wet! Because of the fame of these trendy and colorful bags all around Asia, counterfeit products abound! But there are shops in Ameyoko that sell the authentic ones at an unbeatable discounted price. Plus, certain shops even offer a 10% discount if you make an Instagram post of the bag you like!